On October 24, 1945, a U.S. Navy Helldiver left Burlington, Vt., headed for Quonset Naval Air Station in Rhode Island, when it crashed into South Mountain at the 2,300 foot level, cutting a wide path and scattering wreckage over a large area. Both men aboard were killed. 150 searchers found the wreck site after two days. 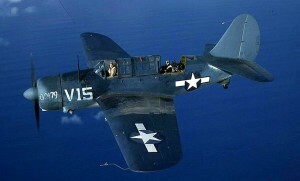 The pilot was Ensign Walter G. Smith, Jr., 22, of Kansas City, Mo. The passenger was 28-year-old Lt. Cmdr. Maurice M. Stone of Raleigh, North Carolina. Stone was the executive officer of a squadron based at Quonset Point, and had arrived in Burlington with his squadron for Navy Day exercises. At some point his hand became infected, and he was being flown to R.I. for treatment when the accident occurred. Stone was a veteran of the first aircraft carrier based attack on Tokyo, Japan. He was survived by his wife Maureen (Smith) Stone. He’s buried in Savannah, Georgia.